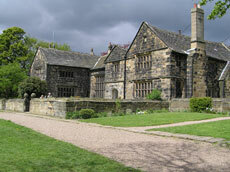 Car Park: Oakwell Hall & Country Park, Nutter Lane, Birstall, Batley, West Yorkshire, WF17 9LG. Entrance to the car park signed “Oakwell Hall Country Park” off A652. Streetmap. 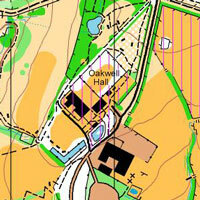 Follow the Orienteering sign to stay on the lane past the 'Countryside centre and play area' parking, towards “Oakwell Hall and visitor centre”. Terrain: Parkland with some areas of woodland and a good path network. The area is used by horse riders, cyclists and very many dog walkers. Map: 1:5000, 5m contours. Note: The benches are not mapped. NB: This is not a SIAC event. All controls have to be 'dibbed'. Starts:10.30 am to 12.30 pm. Entry Fees: Adults £8, Juniors £4. Spaces on the start list have been reserved for both Adults and Juniors who can enter any course. Entries: Enter on the day at Registration. Entries for the Yvette Baker Trophy event have now closed. No Shadowing: All competitors in the Yvette Baker will be club Orienteers and had some experience or coaching, therefore to maintain the integrity and fairness of the Yvette Baker competition adults will not be allowed to shadow juniors who have entered the competition. Public Toilets: on site at the Visitor centre adjacent to Registration. White 0.9 20 White course maps will be available for looking at and issued in Registration. Green 4.4 125 The Green course is in 2 parts on both sides of the map. Score Course: There will be a 45 minute punching start score event with a difference, please see full details at registration. Starts: approximately 200m from Registration, approximately 150-300m from Car Park. Free O-Maze: Fun event for Children/Juniors. Courses Close at 2.00 pm. Safety: Whilst a full Risk assessment has been carried out competitors will be responsible for their own safety. Competitors take part at their own risk. Waterproof jackets may be compulsory in the case of bad weather and if this proves to be the case a notice to this effect will be displayed in the car park. Whistles are advisable. Full leg cover is compulsory and will be checked. Take care not to startle Horses and Dogs. Beware of cyclists. Make sure you have someone who will raise the alarm if you appear to be very late finishing. Lone competitors must leave their car keys at registration and record their name, phone no. and registration number on the entry form.